The world’s best bars have spoken, and they’ve named ANGOSTURA® aromatic bitters and ANGOSTURA® orange bitters as their top bitters brands. 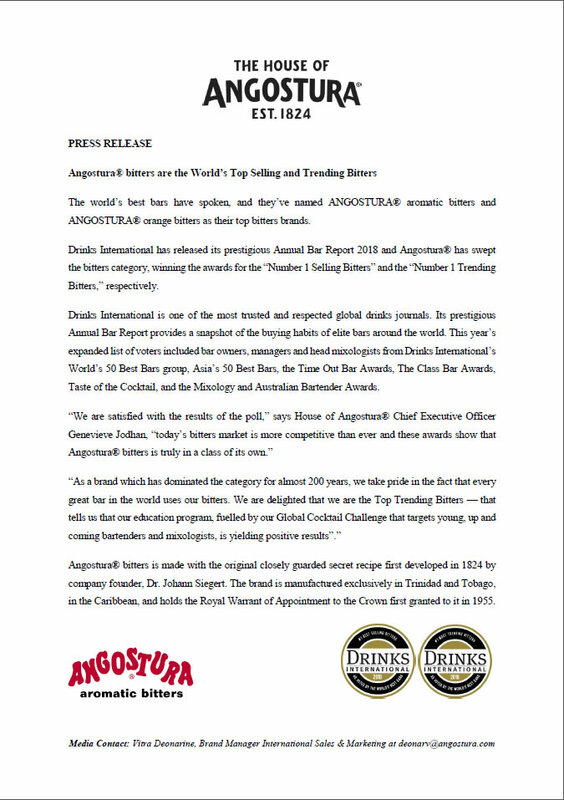 Drinks International has released its prestigious Annual Bar Report 2018 and Angostura® has swept the bitters category, winning the awards for the “Number 1 Selling Bitters” and the “Number 1 Trending Bitters,” respectively. Drinks International is one of the most trusted and respected global drinks journals. Its prestigious Annual Bar Report provides a snapshot of the buying habits of elite bars around the world. This year’s expanded list of voters included bar owners, managers and head mixologists from Drinks International’s World’s 50 Best Bars group, Asia’s 50 Best Bars, the Time Out Bar Awards, The Class Bar Awards, Taste of the Cocktail, and the Mixology and Australian Bartender Awards. Angostura® bitters is made with the original closely guarded secret recipe first developed in 1824 by company founder, Dr. Johann Siegert. The brand is manufactured exclusively in Trinidad and Tobago, in the Caribbean, and holds the Royal Warrant of Appointment to the Crown first granted to it in 1955.